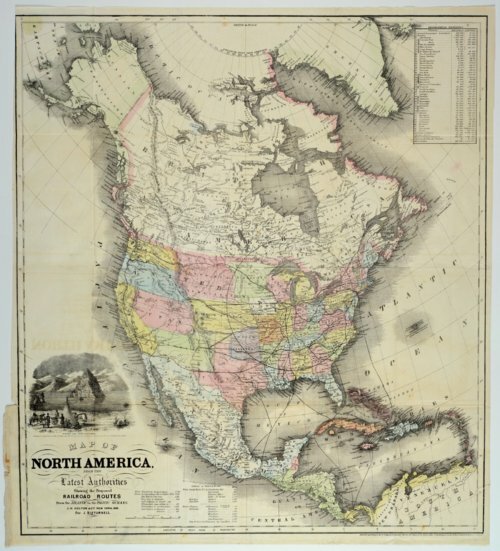 Map of North America detailing the proposed railroad routes across the United States and routes to Mexico, Guatemala, Panama, Cuba, and Jamaica. A table of geographical statistics and a table of distances, as well as an illustration of Pyramid Lake in California, are included. This map is provided through a co-operative project between the Lecompton Historical Society and the Kansas Historical Society. Partial funding was provided by the Ross and Margaret Wulfkuhle Charitable Trust and the Freedom's Frontier National Heritage Area.